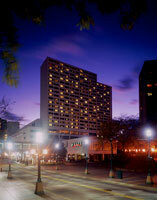 Sigma Tau Delta has reserved a block of rooms for the convention at a special group rate. The room rate is $115.00 per night for single/double occupancy; $125.00 for triple/quadruple occupancy (excluding taxes). This special group rate is available until the room block is full. Important note — there is only a limited number of rooms available at the group rate and this block of rooms may fill before the March 3rd deadline. Please make your reservations early. If you have difficulties making your reservations, email sigmatd@niu.edu. To reserve a room at the Hyatt Regency Minneapolis Hotel, call 800-233-1234 and ask for the Sigma Tau Delta group discount. Email the Central Office at sigmatd@niu.edu. We must receive your request by February 25, 2009. Sigma Tau Delta is not responsible for roommate compatibility. Attendees are responsible for their own reservations and expenses. Light rail trains run every 7 or 8 minutes during peak hours and every 10 to 15 minutes at other times of the day. From the MSP airport, trains can take you to downtown Minneapolis in about 25 minutes. Exit the train at the Nicollet Mall Station (35 South 5th Street), cross the street and take a southbound bus eight blocks to the Hyatt Regency Minneapolis (1300 Nicollet Mall). Light rail fares are $2 during rush hours (Monday through Friday, 6 to 9 a.m. and 3 to 6:30 p.m.) and $1.50 at other times. To reach the station from the airport, follow the "Ground Transportation Atrium" signs to the lower level, then take the tram. To board trains, take the escalator down one level from the tram level and purchase a rail ticket at the vending kiosk. Be sure to request a transfer ticket when you purchase your rail ticket to avoid an additional $.50 bus fare. Shuttle service is available via SuperShuttle located in the Lindbergh (Main) Terminal. Follow the signs stating "Hotel Shuttles and Scheduled Vans" to the "Ground Transportation Atrium.” The SuperShuttle service desk (open 24 hours a day, 7 days a week) is located in the center of the Atrium. A $6.00 discount (normal SuperShuttle fair is $16 one-way) is available for Sigma Tau Delta Convention registrants by booking your reservation through the following link: $6.00 SuperShuttle Discount. Minneapolis, Minnesota, 55403. The local telephone number is 612-370-1234.